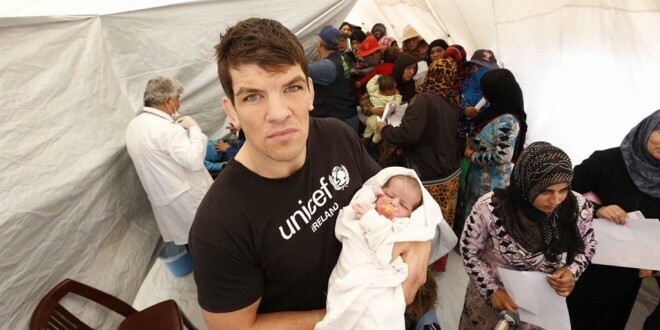 Donncha O'Callaghan in a Syrian refugee health tent. As part of the Change for Good campaign, Aer Lingus has this week launched a special collection on all flights to raise funds for UNICEF’s Syrian appeal. Change for Good is the UNICEF in-flight collection of unused foreign notes and coins to raise funds for vulnerable children around the world. As the conflict in Syria enters its fifth year, 14 million children are in need of humanitarian support, making this the single biggest humanitarian crisis since World War Two. The situation of more than 5.6 million children inside Syria remains the most desperate. Almost two million Syrian children have fled and are living as refugees most of them in Lebanon, Turkey and Jordan. The scale of this crisis is unprecedented; the total number of Syrian children in need of assistance is 15 times what it was in 2012.